A few months ago I along with a few other local bloggers were invited to go to the launch of the Kate Moss Topshop collection here in Calgary. I was so excited to see how her well known personal style would reflect in her collection. The verdict? Great vintage inspired pieces that appeal to all sorts of styles. The quality of the pieces were really amazing too, you could tell a lot of thought and time went into each piece. Although I wish I could have gone home with everything I decided I couldn't leave the store without this tribal inspired dress. The dress is so cute on it's own but I what I realized was that it was a tad short on me so I thought why not pair it with jeans and have it as a tunic? 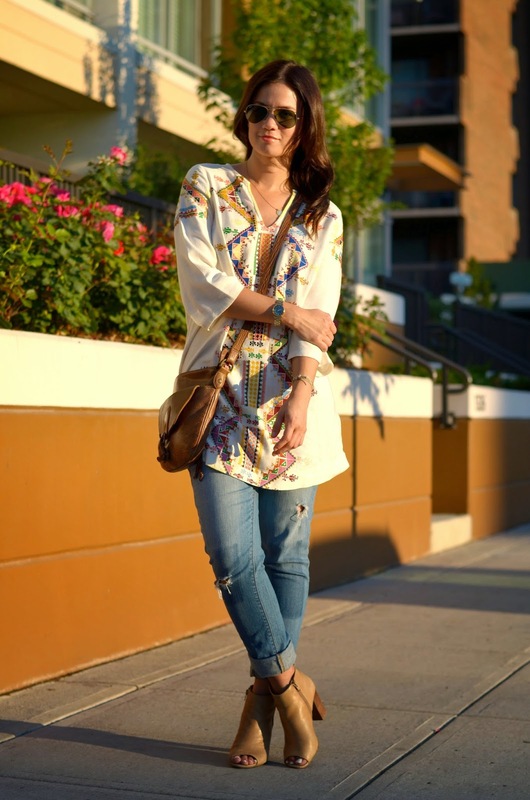 I think it creates a really laid-back boho vibe and it is easily one of my favourite outfits this summer. The possibilities are endless with this dress! Have you ever worn a dress as a tunic? I'd love to know! LOVE!!! A brilliant idea - love those booties too!